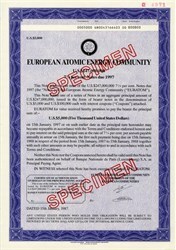 Beautifully engraved RARE $5,000 Specimen Bond Certificate from the European Atomic Energy Community dated 1987. This historic document was printed by the Security Columbian Banknote Company and has an ornate border around it with a vignette the organization's atom logo. This item has the printed signatures of the organization's officers. The European Atomic Energy Community (EAEC or Euratom) is an international organization founded in 1958 with the purpose of creating a specialist market for nuclear power in Europe, developing nuclear energy and distributing it to its member states while selling the surplus to non-member states. It is legally distinct from the European Union (EU), but has the same membership, and is governed by the EU's institutions. Its major project is currently its participation in the international fusion reactor ITER financed under the nuclear part of FP7. Euratom also provides a mechanism for providing loans to finance nuclear projects in the EU. It was established by the Euratom Treaty on 25 March 1957 alongside the European Economic Community/EEC, being taken over by the executive institutions of the EEC in 1967. Although other communities were merged in 1993 and 2009, the nuclear program has maintained a legally distinct nature from the European Union.